UniSlide Elevating Tables address customer requirements for positioners with lifting capabilities and a range of heights. There are four series of UniSlide Elevating Tables to address applications that require additional strength, rigidity and versatility. 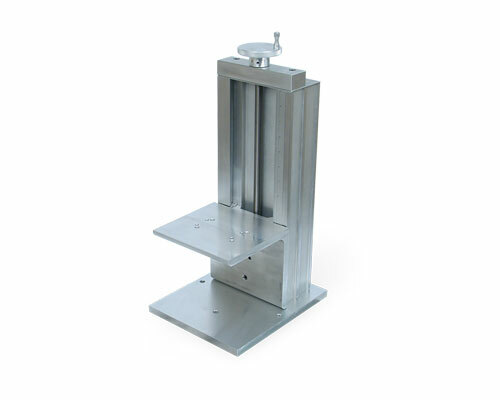 The models in three of the series are designed using the rugged proven UniSlide Linear Stages as the free-standing base mounted in the vertical position with a heavy-duty right-angle platform to carry the payload. 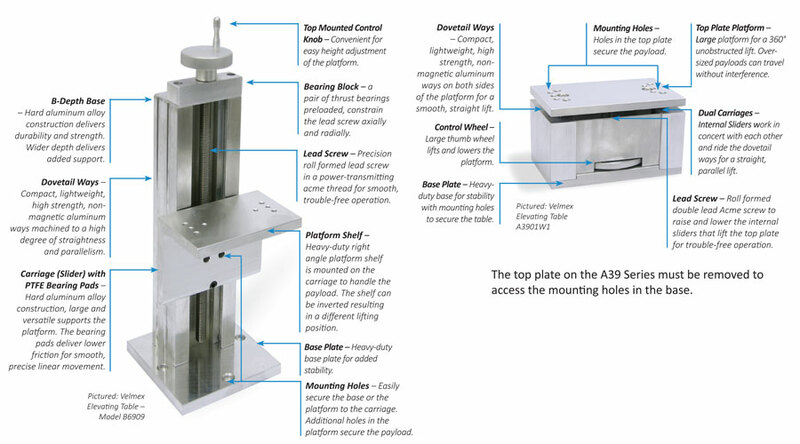 The fourth series – the smaller A39 – pushes up from underneath the platform for a 360° unobstructed lift. Velmex pre-configured Elevating Tables lift to a height of 15.5" (393.7 mm) with a travel distance of 9" (165.1 mm). The large table can handle a payload to 100 lbs. (45.5 kg.). 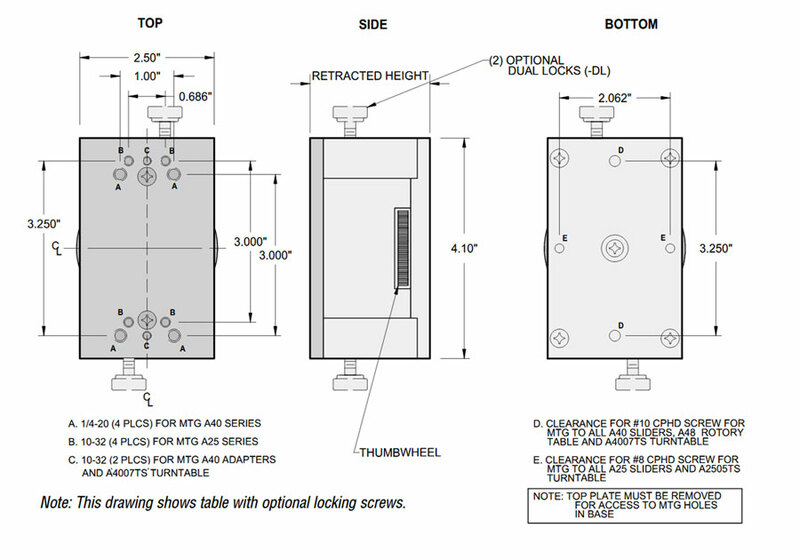 Velmex pre-configured Elevating Tables are manually operated. 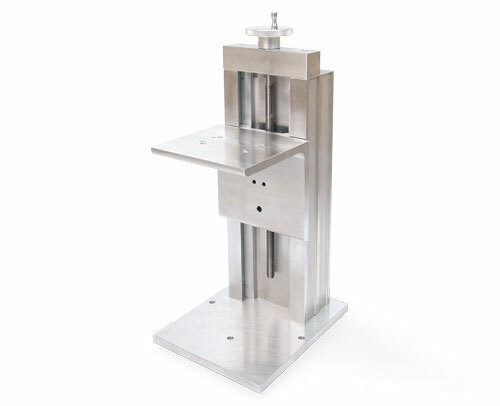 To lift a payload utilizing a motor, look at using a motorized UniSlide® or BiSlide® mounted vertically. 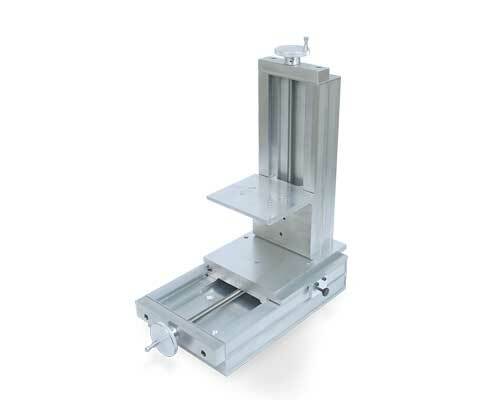 Should the need for a different configuration, length or payload capacity arise, most manual or motorized Velmex linear stages can be mounted vertically and used as an elevating table. A39 Series – Two models with a lift range of 1" (2.54 cm) to 3.25" (8.26 cm) and a maximum vertical payload capacity of 25 lbs. (11.34 kg). These models feature an unobstructed tabletop platform. 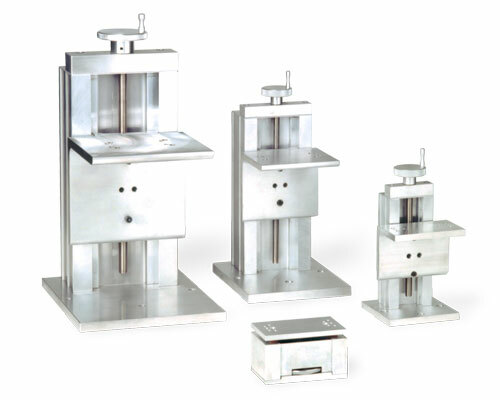 B29 Series – The smallest of the vertical tables with a maximum payload capacity of 30 lbs. (13.6 kg) and vertical travel range of 1.5" (3.81 cm) to 6.5" (16.51 cm). Three models in this series. * Alternative lead screw pitches available. Contact a Velmex application engineer. B49 Series – These elevating tables have a maximum payload capacity of 50 lbs. 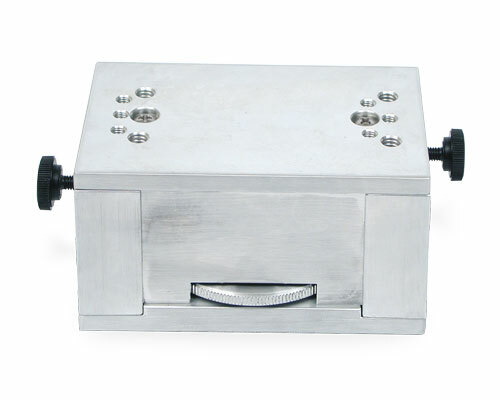 (22.7 kg) and vertical travel range of 2" (5.1 cm) to 8" (20.32 cm). Three models in this series. 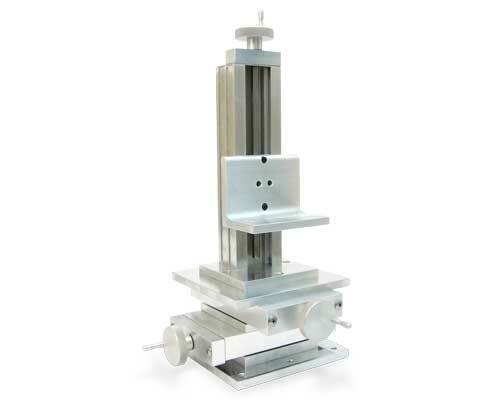 B69 Series – The tallest of the vertical tables with a maximum payload capacity of 100 lbs. 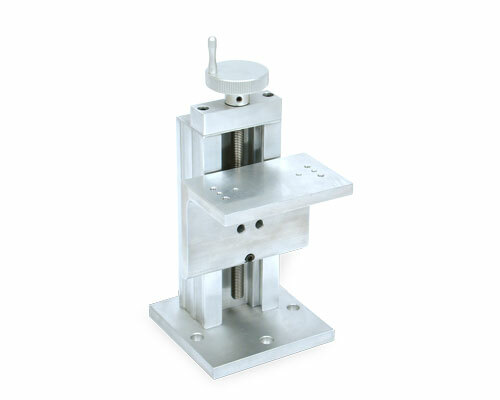 (45.5 kg) and vertical travel range of 3" (7.62 cm) to 9" (22.86 cm). Three models in this series. B29 10 0.100" W1 100 3/8"
B49 10 0.100" W1 100 3/8"
B69 10 0.100" W1 100 1/2"
A39 10 0.100" W1 100 3/8"
For details on either lock, please see Motion-Locks page. 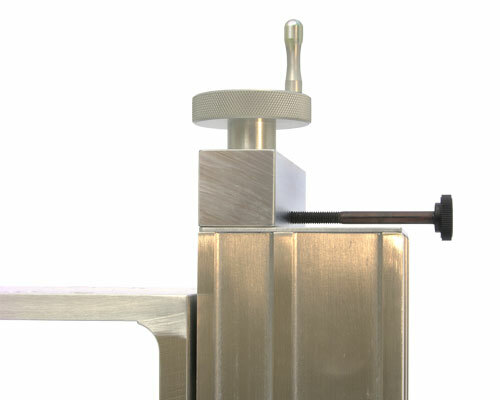 Alternative Knobs – The knob with the crank is standard on Velmex Elevating Tables. 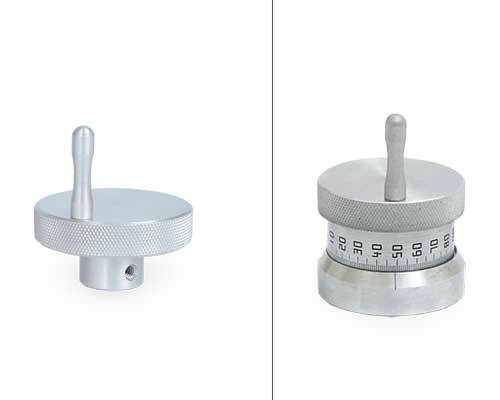 A Graduate Knob with the scale mounted on the top side of the base is optional. 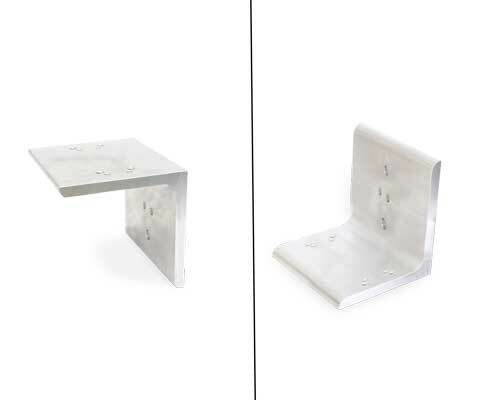 Platform Shelf – A right angled bracket designed to be used with UniSlide® Elevating Tables. 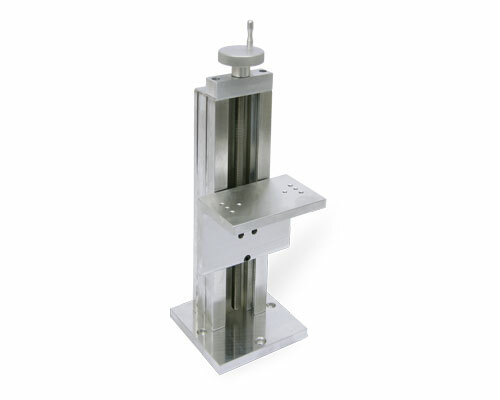 However, they also can be used with vertically mounted UniSlide Assemblies to support a payload. The shelf can be inverted depending on the motion required. 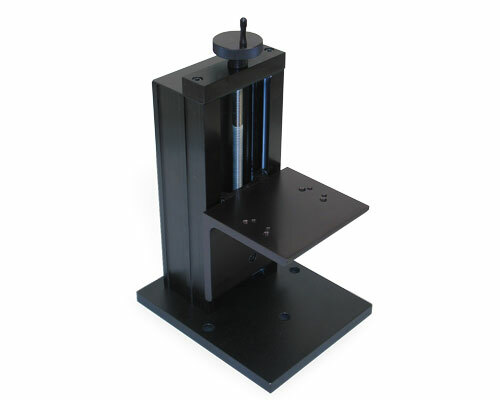 For more specifics and to see the shelf in use on a Velmex stage visit the UniSlide Adapters page. NOTE: Lead Screw pitch variations are represented by a single drawing number. For example - B2906W1 becomes B2906XXX. 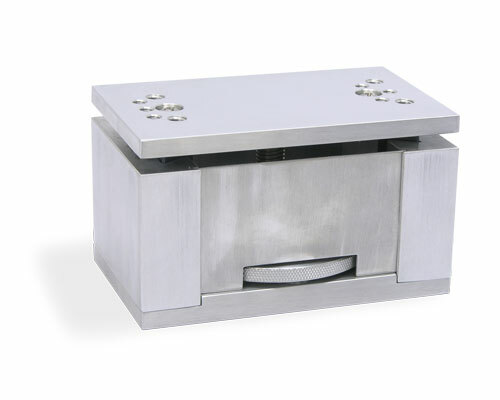 A "W1" lead screw pitch is standard with Velmex Elevating Tables, although other lead screws are available. Pictured in our gallery are examples of configurations for manual pre-configured UniSlide Elevating Tables, along with configurations that also include other Velmex products. Product and accessory offering is subject to change and availability. Why would I use an Elevating Table? You would use an elevating table when you require free standing vertical travel with a platform shelf. The Velmex Elevating Tables are more rigid then turning a linear stage into a vertical axis, making them more stable. 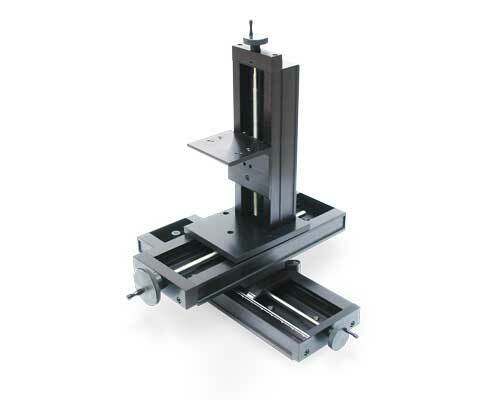 However, if you do want longer travel distance or a narrower or wider frame, almost all Velmex linear stages can be converted to an elevating table with the addition of a base plate and a platform shelf. They can be engineered to provide added rigidity, support and stability. 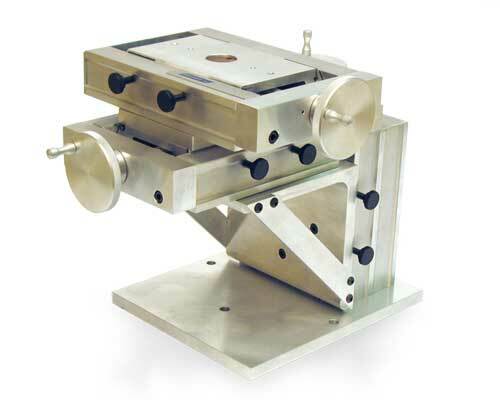 What comprise Velmex Elevating Tables? Velmex Elevating Tables are made of Velmex world renown UniSlide assemblies. They use a deeper base under the dovetail ways for added support and feature an oversize base for added stability in the vertical position. 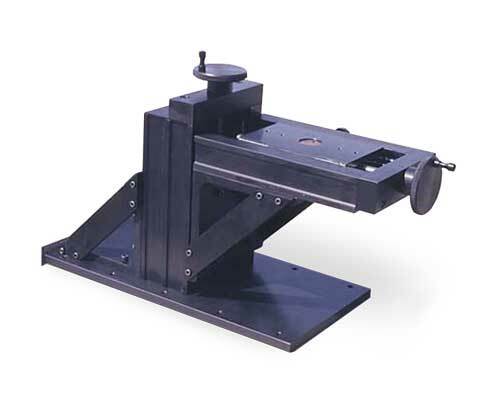 A right angle platform is mounted to the carriage that can be mounted in the inverse to add versatility to the travel envelope. Do Velmex Elevating Tables use lead screws other than the "W1" with 0.100" per revolution? Yes. 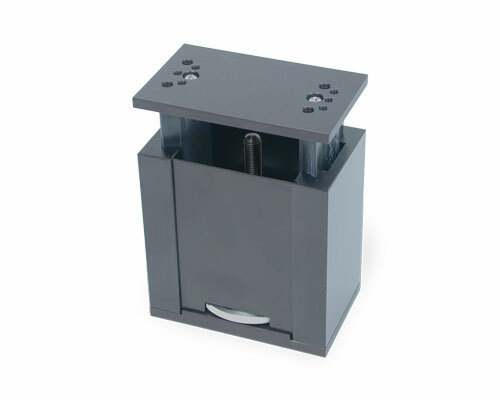 Velmex Elevating Tables are standard with the W1 lead screw. Finer pitch lead screws with greater sensitivity are available as an option. Do UniSlides need lubrication and how often? 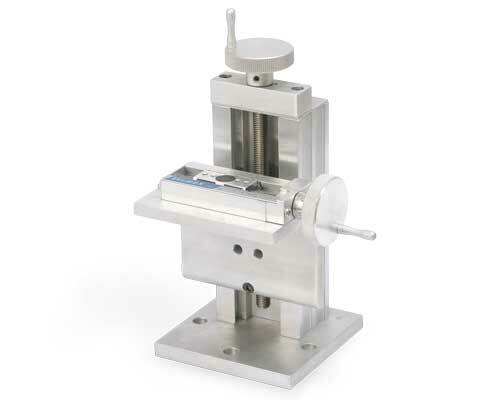 Lubrication is important for motion systems or wherever you want maximum life and the lowest friction. UniSlide Assemblies can be lubricated with Velmex Lubriplate Aero®. Only a few drops are required to keep your slide running smoothly. The load and hours of use effect the amount and frequency of lubrication. See the user guide that came with your UniSlide for recommendations. Can UniSlides Tables be mounted together? Yes, UniSlides can be mounted together in XY, XZ, XYZ configurations. 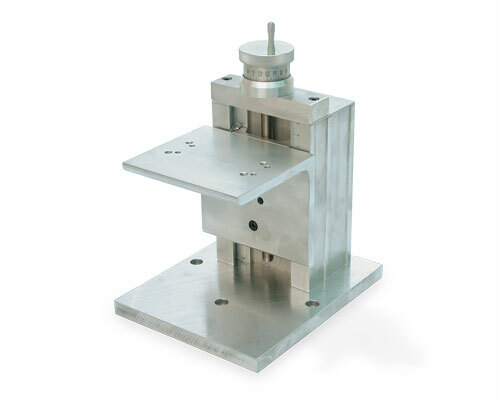 Mounting UniSlide assemblies in multi-axis systems requires the use of adapter plates and brackets. 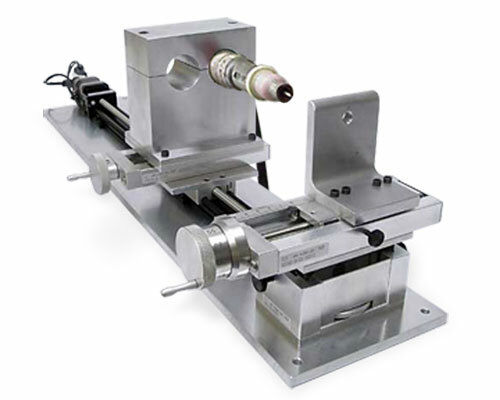 They also can be combined with Velmex Rotary Tables and our other linear stages to make custom systems to meet a wide range of applications. See UniSlide Options and Accessories for more information on the plates and adapters. Also see our examples pages for images featuring Elevating Tables combined with other Velmex products. 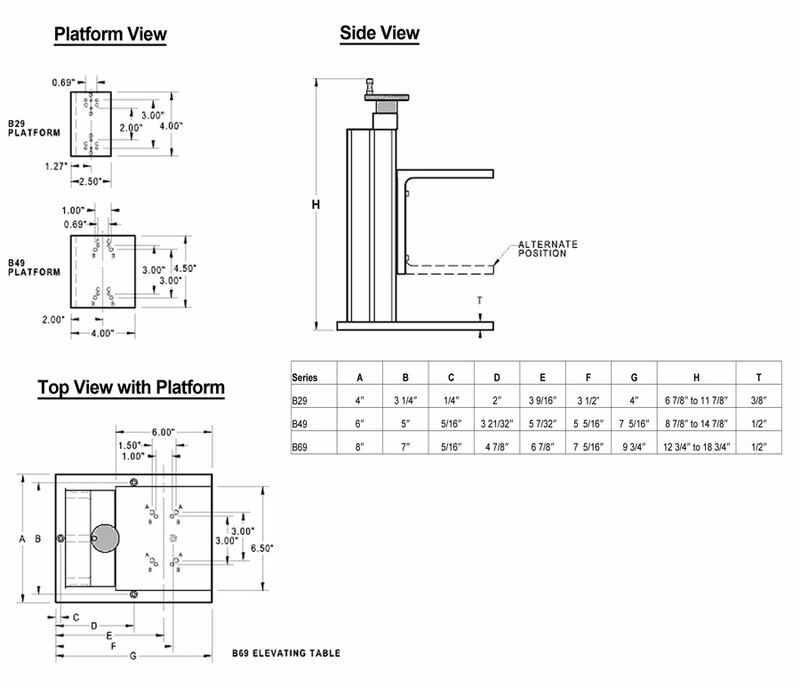 If you have questions about your specific application or want us to design a system incorporating Velmex UniSlide Elevating Tables, please complete the Request Assistance form or call Velmex to speak to one of our Application Engineers.